The Kinetic Simulation Algorithm Ontology (KiSAO) supplies information about existing algorithms available for the simulation of Systems Biology models, their characteristics, parameters and inter-relationships. KiSAO enables the unambiguous identification of algorithms from simulation descriptions. Information about analogous methods having similar characteristics and about algorithm parameters incorporated into KiSAO is desirable for simulation tools. To retrieve this information programmatically an application programming interface (API) for KiSAO is needed. We developed libKiSAO, a Java library to enable querying of the KiSA Ontology. It implements methods to retrieve information about simulation algorithms stored in KiSAO, their characteristics and parameters, and methods to query the algorithm hierarchy and search for similar algorithms providing comparable results for the same simulation set-up. Using libKiSAO, simulation tools can make logical inferences based on this knowledge and choose the most appropriate algorithm to perform a simulation. LibKiSAO also enables simulation tools to handle a wider range of simulation descriptions by determining which of the available methods are similar and can be used instead of the one indicated in the simulation description if that one is not implemented. LibKiSAO enables Java applications to easily access information about simulation algorithms, their characteristics and parameters stored in the OWL-encoded Kinetic Simulation Algorithm Ontology. 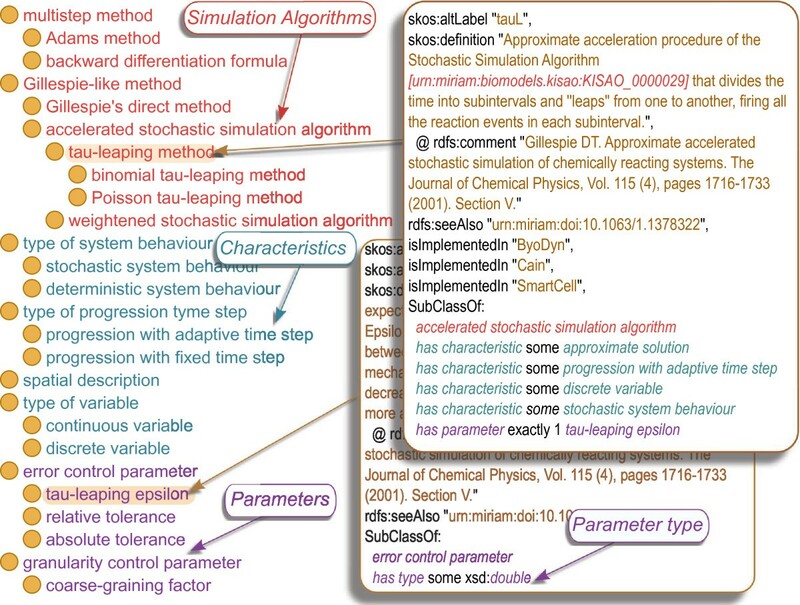 LibKiSAO can be used by simulation description editors and simulation tools to improve reproducibility of computational simulation tasks and facilitate model re-use. The reproducibility of a computational simulation task is of crucial importance in systems biology, and requires that both the algorithm used and the initial set-up need to be identified. These minimum information requirements are described by the MIASE guidelines . The Kinetic Simulation Algorithm Ontology (KiSAO)  addresses the issue by classifying algorithms available for the simulation of Systems Biology models (e.g. tau-leaping method, finite element method) which allows them to be identified unambiguously from simulation descriptions, such as SED-ML . Information about algorithm characteristics (e.g. progression with adaptive time steps, stochastic system behaviour) incorporated into KiSAO enables the identification of similar algorithms. This knowledge helps simulation software to automatically choose the best algorithm available to perform a simulation, and, if the original one is not implemented, to use an alternative algorithm that will provide comparable results. The structure of KiSAO is represented in Figure 1. Structure of KiSAO. The Kinetic Simulation Algorithm Ontology (KiSAO) consists of three main branches representing the hierarchy of simulation algorithms, their characteristics and their parameters. The relationships has characteristic and has parameter are used to link algorithms to the characteristics they possess and parameters they use. The algorithms stored in KiSAO are annotated with their names, synonymous names, descriptions and links to the articles describing them. Information about parameter types is also incorporated into KiSAO. Since KiSAO is implemented in OWL 2 , developers of libraries and tools processing simulation description languages could potentially work with KiSAO using general programming interfaces for manipulating ontologies, such as OWL API , and ontology reasoners, such as HermiT . Richer programming interfaces for interacting with ontology resources are also available, e.g., OntoCAT , an application suite enabling the querying of several resources simultaneously, looking for synonyms and definitions (which is not supported directly by OWL API). Nevertheless, due to the complex structure and variety of relationships used in KiSAO, none of these interfaces provide an easy way to retrieve all the information from KiSAO. Moreover, some operations require the knowledge of how KiSAO is organised. For instance, to find similar simulation algorithms both the hierarchical structure of the algorithm sub-tree of KiSAO, and algorithm-characteristic relationships should be taken into account. It is more efficient and convenient for developers to use a higher-level, KiSAO-specific API. We therefore developed libKiSAO to address this need. LibKiSAO is a Java library which uses the OWL API  and the HermiT reasoner  to implement an intuitive interface for querying KiSAO. It is available under the LGPL license for anyone to use and extend. We chose the Java language for the implementation because of its platform independence and wide adoption. The compatibility requirements of the Hermit reasoner restricted us to Java version 1.5 or higher. LIbKiSAO consists of two parts. The first part is a general purpose ontology querying library libOnto, wrapping some of the OWL API low-level functionality to implement shorter methods, which are more clear for non-ontology specialists. Examles are getSynonyms(), getPropertyValues(), searchByName(), which are not implemented natively in the OWL API but are often used while working with ontologies. LibOnto can be used separately from libKiSAO for various ontology-querying purposes and is independent of any knowledge about the KiSA Ontology. An Ant build script which packs libOnto into a separate jar archive is available for download from the project website . The second part of libKiSAO is represented by the interface http://ww.net.biomodels.kisao.IKiSAOQueryMaker and its implementation net.biomodels.kisao.impl.KiSAOQueryMaker. It implements KiSAO-specific functionality and uses libOnto to work with OWL. The implemented KiSAO-querying methods are described in detail in Tables 1, 2. LibKiSAO allows users to choose any particular version of KiSAO they are interested in working with, stored as a local file or on the web, by specifying a constructor parameter. By default the latest release of KiSAO (referred to by the KiSAO URI ) is selected. The table lists the methods implemented in libKiSAO which enable querying the taxonomy level of KiSAO. The table lists the methods implemented in libKiSAO which enable querying the complex/application level of KiSAO. KiSAO-specific library part implements such methods as looking for algorithms having particular characteristics or algorithm grouping methods with similarity distance based on algorithm characteristics and hierarchy relationships. A user can specify which characteristics should be considered while looking for similar methods. For example, getNMostSimilarAlgorithms(poissonTauLIri, 4, KiSAOIRI.TYPE_OF_SYSTEM_BEHAVIOUR_IRI, KiSAOIRI.TYPE_OF_VARIABLE_IRI) returns 4 algorithms having the same type of system behaviour (stochastic) and of variables (discrete) as the Poisson tau-leaping method, and sorted by the hierarchical distance to it: tau-leaping method, multinomial tau-leaping method, binomial tau-leaping method, and implicit tau-leaping method. Other characteristics are not taken into account (e.g. method type can be implicit as well as explicit). If the distance in the hierarchy tree is not important, the method getAlgorithmsWithSameCharacteristics(IRI.. characteristicType) can be used. By default (if no characteristic types are specified) all the characteristics are looked at. Currently all the characteristics are equally important for the algorithms finding similar simulation methods. In the future they might be prioritized to improve the similarity measurement. Code examples and Java documentation are available both for download and on-line from the project website . LibKiSAO supports working with KiSAO at taxonomic and complex/application levels . The taxonomic layer represents a hierarchy of simulation algorithms, annotated with the information about their names, definitions, and references to the articles they are described in. For instance, as shown in Figure 1, the tau-leaping method is an ancestor of the binomial tau-leaping method and is annotated with the synonym tauL. The complex and application levels of KiSAO enable algorithm grouping based on characteristics (e.g. stochastic/deterministic system behaviour), link algorithms to the parameters they use (e.g. tau-leaping method ’has parameter’ tau-leaping epsilon), and describe parameter types (e.g. tau-leaping epsilon ’has type’ xsd:double). LibKiSAO provides Java applications with the mechanisms to retrieve this information programmatically from the OWL-encoded KiSAO. LibKiSAO can be used by simulation description language manipulating libraries, such as jlibSEDML , and simulation tools, such as COPASI . LibKiSAO provides methods for listing simulation algorithms stored in KiSAO and searching for them by names, synonymous names, MIRIAM URIs  and identifiers. Retrieving algorithm descriptions, synonyms and references to the articles describing the algorithm is also implemented, as well as methods for querying algorithm hierarchy, such as searching for descendant (derived from, more specific) and ancestor (more general) algorithms. The supported taxonomy querying methods are listed in Table 1. Use case 1 describes how querying KiSAO taxonomy level capabilities of libKiSAO can be used by simulation description language editors, such as SED-ED , a tool for editing, viewing and running SED-ML files. A simulation experiment encoded in SED-ML includes the information about the algorithm(s) to use. The algorithm is referenced by its KiSAO identifier, e.g. <algorithm kisaoID=”KiSAO:0000088”>. Since this alphanumeric identifier does not provide human-readable information, the SED-ML editing tool should also present the algorithm name and its description in the graphical user interface. Using libKiSAO, SED-ML editors can easily map algorithm identifiers used in SED-ML to the human-readable information describing them. Figures 2a,b show such a mapping for the tau-leaping method: The SED-ML file contains the algorithm identifier (’KISAO:0000039’), which can be parsed by libraries, such as jlibSEDML, and then, using libKiSAO, mapped to the algorithm name, description and other information about the algorithm contained in KiSAO. This information can then be displayed to the user. The reverse mapping is also possible: Having an algorithm chosen in the user interface, a simulation description editor can easily obtain its KiSAO identifier using libKiSAO, as shown in Figures 2c,d. Use of libKiSAO by simulation description editors. LibKiSAO provides simulation description editing tools with a mapping between KiSAO identifiers used in SED-ML and human-readable information about the algorithms. LibKiSAO implements characteristic-based grouping of the simulation algorithms, stored in KiSAO, by providing methods for searching for the algorithms which possess/lack given characteristics, as well as querying for the characteristics of a given algorithm. LibKiSAO also includes methods for retrieving information about simulation algorithm parameters and their types. The complex/application level querying methods available are described in more details in Table 2. These features enable simulation tools dealing with SED-ML descriptions to automatically handle a wider range of simulation tasks, as it is discussed in use case 2. Simulation tools use simulation descriptions as an input and provide numerical results as an output. Given a simulation description containing a KiSAO identifier of a simulation algorithm (e.g. KiSAO:00000071), a simulation tool first needs to identify the algorithm (e.g. LSODE). This can be done using libKiSAO (see Figure 3a). Since a simulation tool is unlikely to implement all the algorithms available for simulation of Systems Biology models, it is possible that the method indicated in the simulation description is not available (Figure 3b). The knowledge of algorithms having similar characteristics incorporated into KiSAO, and accessible via libKiSAO, will help simulation tools to choose an alternative method having similar characteristics, among those that they implement (Figure 3c). Use of libKiSAO by simulation tools. LibKiSAO provides simulation tools with information about available simulation methods, as well as analogous methods which can be used if the one indicated in the SED-ML description is not implemented. In the future versions of SED-ML not only defining an identifier of a simulation algorithm, but also its parameters and their values might be supported . In this case libKiSAO methods for extracting KiSAO knowledge about parameters common for different algorithms, will help simulation tools to switch between similar algorithms easier. LibKiSAO therefore provides simulation tools with additional knowledge about available simulation methods, allowing them to automatically handle even the simulation descriptions referring to algorithms they cannot access. The ability to choose related algorithms is also desirable in a web-service based environment. Since a particular solver service may not always be available, it is important to determine ones which can be used instead. LibKiSAO functionality to indicate similar algorithms can help to search for alternatives from a list of simulation providers, such as Biocatalogue , the life science web services registry. We have developed a Java library for querying the Kinetic Simulation Algorithm Ontology. LibKiSAO helps modellers to encode their simulation tasks in unambiguous languages, such as SED-ML, which can be understood by other modellers and also by simulation tools. It enables accurate and repeatable execution of computational simulation tasks and facilitates the re-usability of models in Systems Biology. Simulation Experiment Description Markup Language. This work was supported by the European Molecular Biology Laboratory. NLN introduced the conception and design of libKiSAO and critically revised the manuscript. CL participated in the design of libKiSAO. RA provided some of the requirements and testing of libKiSAO. AZ developed libKiSAO and drafted the manuscript. All authors read and approved the final manuscript.